Today's square finishes the first row of my 39 Squares project. Boy are we having fun! Check out all the stitchalongs posted in the sidebar of the 39 Squares blog (they are listed with the most recently updated blogs on top) or go to the Flickr page here and see all the wonderful squares. This is turning out to be a really, really fun project. If you want to jump in, please do...the water's fine! And does anyone know...is Amy's big day at the end of the squares? Oh Amy! These are all so, so sweet! Have been away on a ski vaca and just back home. I love your stitching and would luv to play along. I just finished my first two squares and posted to the flickr group. Will post on my blog tomorrow as well. 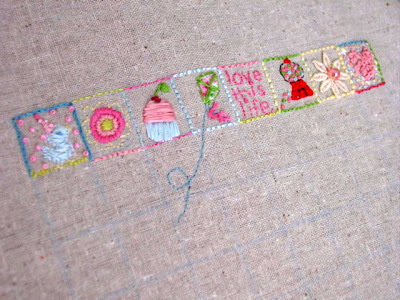 Hi Amy, Have you done a template, pattern, or a tutorial yourself? You would be a natural. I just love this idea, how fun! Wanted to pop in to check on you and say hello! !